When guitarist Bill Kirchen rolls into the Sportsmen’s Tavern, 326 Amherst St., for a Honky Tonk Holiday Show at 7 p.m., those won’t be Christmas carols on his song list. Filling the air will be songs like “Truckin’ Trees for Christmas,” “Reindeer Boogie,” Albert King’s blues classic “Santa Claus Wants Some Lovin'” and that old Commander Cody favorite, “Daddy’s Drinkin’ Up Our Christmas.” Tickets $20. Forget the Nutcracker and Handel’s Messiah. They’re so overdone. 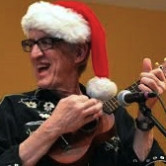 For a taste of real holiday cheer, nothing says joy to the world and peace on earth like Bill Kirchen singing Daddy’s Drinkin’ Up Our Christmas. Bill and Too Much Fun make a stop on their annual Honky-Tonk Holiday Tour at Buffalo’s Sportsmen’s Tavern on Thursday, December 4 at 7 pm. Featured is a sleigh-full of rarely heard holiday numbers from the blues, rock ‘n’ roll and honky tonk bags. Silent Surfin’ Night? You bet. Truckin’ Trees for Christmas? Of course. Santa Looked A Lot Like Daddy? Oh yeah. And so many more. Let the joy be unrefined! Guitar Player Magazine dubbed Kirchen the “Titan of the Telecaster.” Rolling Stone said he’s “an American treasure” and “one of our best.” No matter what you call him, Bill Kirchen is a founding father of the Americana movement, now at the peak of his impressive career. Kirchen was originally known as co-founder and lead guitarist of Commander Cody and His Lost Planet Airmen, one of the first and only rock-n-roll bands to infuse their honky-tonk sound with pure, blood-and-guts country roots and western swing. It was Kirchen’s scorching guitar licks that helped define their sound and drove their hit, “Hot Rod Lincoln,” into the Top Ten in 1972, a song that eventually took on a post-Cody life of its own. Today, Kirchen’s extended version of “Hot Rod Lincoln” is his universally loved signature masterpiece, a pumped-up joyride through the last 60 years of guitar-god history, described as “epic” by Rolling Stone. In 2001, Kirchen received a Grammy nomination for his instrumental “Poultry in Motion.” The following year he was inducted into the Washington Area Music Association Hall of Fame, neatly sandwiched between John Phillip Sousa and Dave Grohl. Kirchen has recorded and/or played guitar live with a who’s who of Americana and Roots Rock ‘N’ Roll, among them Gene Vincent, Link Wray, Bo Diddley, Hazel Dickens, Doug Sahm, Hoyt Axton, Emmylou Harris, Maria Muldaur, Dan Hicks, and Nick Lowe. Bill is pretty sure that he is the only person to have, in a single year, stood on stage and played with both Ralph Stanley and Elvis Costello. Bill is currently touring with his all-star, all-Austin band: Rick Richards on drums and David Carroll on stand-up bass. Richards has made records and toured with Ray Wylie Hubbard, among many others. This brought him to the attention of Ringo Starr, whose recommendation led to the last three stadium tours drumming with Joe Walsh. David Carroll has played bass with a who’s who of Austin artists, including stints with Billy Joe Shaver and Jerry Jeff Walker and a run with Ray Price.